Grace loves to play outside. During the winter, we spent most days snuggling on the couch watching her shows or on the floor coloring. Almost always in pajamas and slippers since they are so much more comfy and cozy than regular clothes. Now, Grace thinks if we get dressed it means we're going out. So I have to time it just right and only dress her when I am ready to spend a couple of hours outside playing. 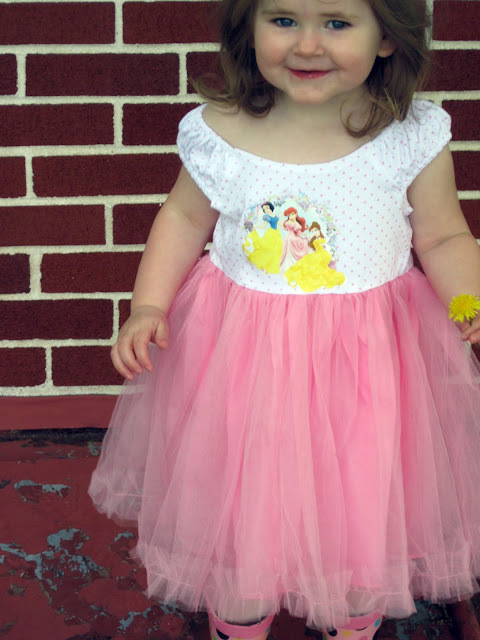 Last week, I tried her new Disney Princess tutu dress on her to see if it fit. I barely had the dress on her before she ran to find her rain boots and then insisted that I put them on her. I would totally wear a tutu and rainboots. That is the sweetest thing! Love it! What a great shot!!!!! I leave with a huge, giant smile on my face. Thank you! I'll be back for more. The young lady is already showing some fabulous fashion sense! Adorable! Awe, precious! Love her eyes! Come on over, check out my site and link up when you get a chance. Precious! She's going to be a heart-breaker someday! And, perhaps, a fashion stylist. Nothing goes together better than tutus and rain boots! I see that she also picked you a dandelion! I'm sure it was a lovely day; have a happy WW! 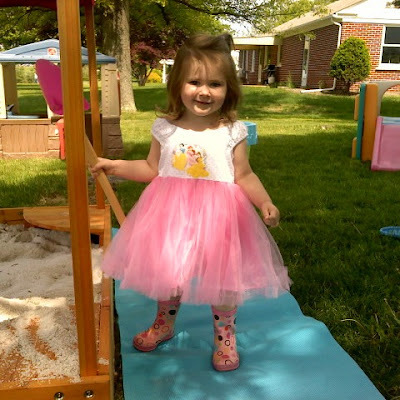 If looking at that sweet face (and awesome tutu) doesn't make you smile ~ nothing will!! rain boots with a princess dress eh? haha. maybe she thinks of the rain boots as "special" and this is for sure a super special dress. she is adorable! Awww...she is precious! I have 4 daughters. They are so much fun! it looks fantastic..she is so cute!